Mariusz Gil is software architect focused on high performance and scalable web applications. Trainer, consultant, meetups organizer and conference speaker. He has been working for several companies on projects for millions of active users, from biggest social network and instant-messaging software in Poland to multi-billion PV content personalization and discovery platform. 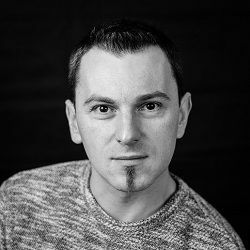 Mariusz is also involved at 4Developers, PHPCon Poland and DDD Now conferences. Big-data enthusiast and data-scientist wannabe. After hours, biker and rock guitarist. Gathering the data is not a problem today. The bigger challenge is to understand these informations and draw some conclusions. Fortunately, we can use some techniques like Machine Learning to „teach” computer how to learn from our data. Fast artificial neural networks, random forests, SVMs, classification, clustering - just to name a few concepts ready to use… We will apply all these solutions to Python application to deliver automatic insights/predictions and create a real business value for a client. By the end of this session you will be familiar with Machine Learning ideas and prepared to solve unsolvable problems.